Together in a bowl, mix the meat, egg, garlic, salt and mint leaves. Then add in the rice (or breadcrumbs). Next, in a very large (12-inch) skillet (I like to work in heavy cast iron or nonstick), heat the oil (or one of its stand-ins) over medium. When it's hot, add the meatballs in a single uncrowded layer. As they brown on one side, turn them with tongs or a spatula, continuing until they're evenly and richly browned all over, 6 to 8 minutes. While the meatballs are browning, combine all the ingredients for the tomato-chipotle mixture in a blender jar and pulse until coarsely pureed. When the meatballs are ready, pour the sauce mixture evenly over the top, making sure to coat the meatballs evenly and loosen any that may be sticking a little. After covering the pan and reducing the heat to medium-low, let the meatballs cook for about 10 minutes more, until they're cooked through. To serve the meatballs, remove them to 4 dinner dinner plates, leaving behind as much of the sauce as possible. Raise the temperature under the skillet to medium-high and stir in 1/3 cup water (or beef broth, chicken broth, beer or wine) and let the sauce simmer for a minute or two. Season the sauce with salt (usually about 1 teaspoon) and spoon it over the meatballs and your albodingas are ready. I’ve made a similar recipe that actually uses crushed tortilla chips as the binder (instead of rice or bread crumbs) and it gives them an unbelievable hint of corn flavor…..so very good! Can I omit rice & bread for low carb option? Or sub cooked sweet potatoes ? Love this easy recipe. I’m making it for a Mexican food pot luck in early December. Of course I’ve made it at home already and really enjoyed it. Thanks for sharing. True Mexican food is an adventure and an experience. I’m glad you like it. It is very nutritious to boot. 😀 Saludos! My wife is Mexican (and so am I now), and her recipe calls for “bread” (bolillo, white bread, etc) and milk as the binder. She adds garlic, pepper, and chipped chipotle to the meatballs. The sauce (more of a soup really) is simply boiled (or roasted) Roma tomatoes, white onion, garlic, pepper, chipotle, and Knorr (and/or salt) to taste all whirred in a blender. The albondigas (o almondigas segun RAE.ES) are dropped in and cooked in the soup. 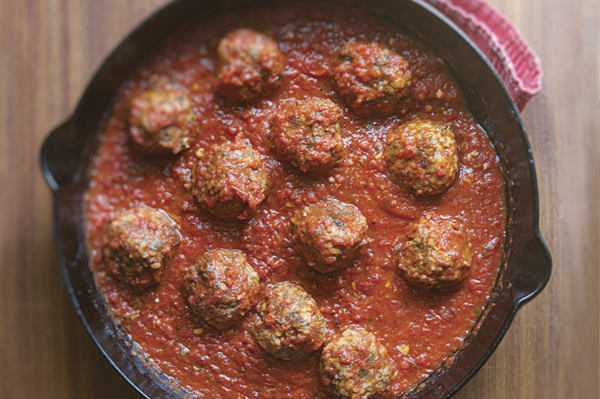 These meatballs make me so happy – this is my favorite dinner IN THE WORLD! I have served this for favorite company, and for Christmas Eve dinner. The cookbook calls for tiny chunks of bacon 🙂 I like to double the recipe and freeze leftovers. I am making it tonight lucky me. 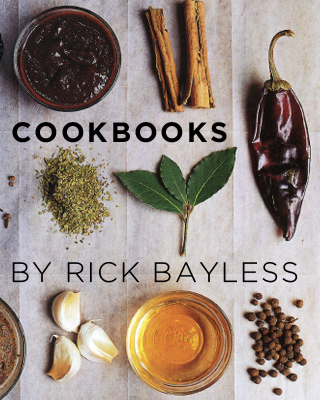 Thank you, thank you, Rick Bayless.